Yes, Christmas is coming, and all microwave engineers, good or bad, need to get what's coming to them. There are two kinds of gifts in the world... We don't offer these gifts because we want to exploit this web site and grab as much money as possible, we do it to share the magic that is Microwaves101! Gifts that say "I hate you"
Does your office have a lame "grab bag" where you have to bring in a <$15 gift? Don't know what to get, now that Mr. T lunchboxes have become "collectible?" 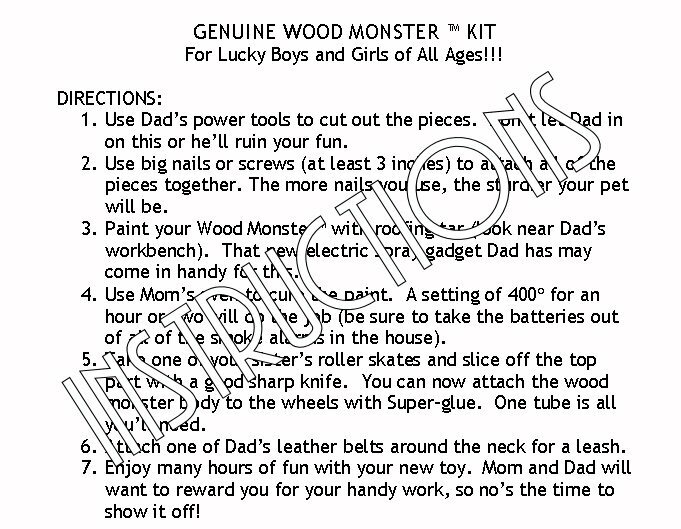 We have the perfect gift, it's called the WoodMonster, and it comes ready to assemble from P-N Designs! It's this year's must-have gift, so order now before we run out of forests to supply the raw materials for this gem! The WoodMonster has everything you want in a joke gift. It literally looks like you made it yourself, but we'll send a receipt so you can prove you didn't. It comes with instructions for assembly, yet no one will ever assemble it. If someone follows the directions they will lose a finger or burn down the house. When you are done laughing at its pitifulness, use it for kindling under your Yule Log! It's "fun for boys and girls of all ages", so you can give it to your boss's twelve year old kid. It won't be your fault if he ends up in "Juvey!" No two WoodMonsters are the same, they are made from recycled building products such as cut-up pallets, and may already have been painted or have nails in them. These fine WoodMonster kits have not been outsourced to Pakistan, but to keep costs low all artwork is done by underage workers for extremely low pay! PayPal is a great way to purchase stuff on the internet, and our preferred method of payment. If you are not a member of Paypal, scroll down for alternate ordering information. Click here to order a WoodMonster Kit for only $5 plus $5 s/h! Gifts that say " I love you"
OK, there are time when you need a serious gift, and we have you covered. First, check out our list of books just perfect for the microwave engineer in your life. You can order them from the handy Amazon links embedded in the list, or you may be able to have your local book store order them for you. 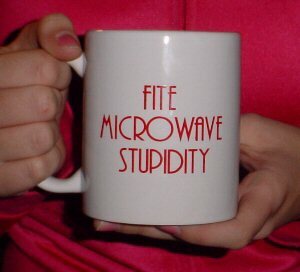 This year we are bringing back a limited quantity of the "Fite Microwave Stupidity" official Microwaves101 coffee mug for the astoundingly low price of $10 (plus s+h). 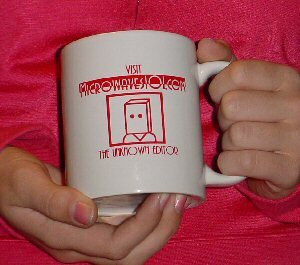 It's your choice of colors, so long as you choose white mug with red text. Are you a member of PayPal? Click here to order a MW101 coffee mug for $10 plus $5 S&H. Shipping is $5 for one gift, $2 each additional. We'll take PayPal (use the "pay now" buttons above), or you can send a check by snail mail. Allow two weeks for delivery, more if you order on December 24. The sooner you place your order, the sooner you'll get the stuff!